Forget about the 1-kilometer-high Kingdom Tower. There will be a building higher than that: the Azerbaijan Tower. It will be fifty meters higher than the Kingdom Tower, have 189 floors and look like a shiny glass, steel and concrete monolith of crap. 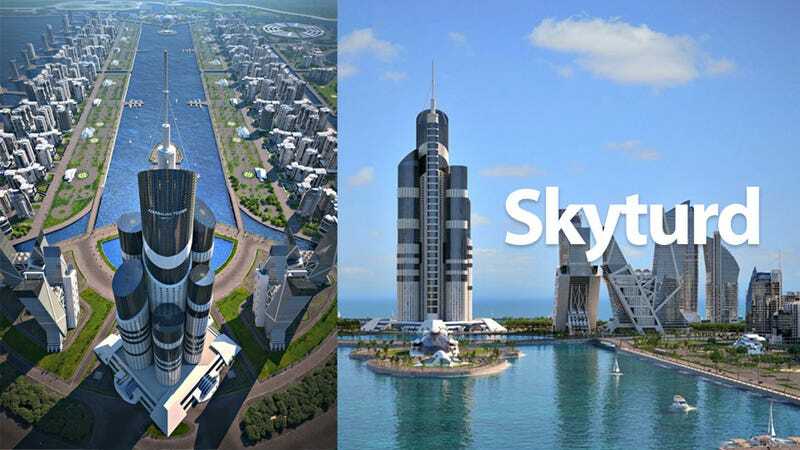 The 1.050-kilometer (3,444.88-foot) Azerbaijan Tower will be built on the Khazar Islands, an artificial archipelago that is being constructed on the coast of the Caspian Sea off Garadag, southwest of Baku, the capital of the country. It's an architectural aberration, a nonsensical bunch of structures tied together into a tower with zero coherence, let alone taste. It looks like an oversized mall growing among other oversized malls. Vertical bad taste. And while you can criticize the super-tall towers in the Arab Emirates, at least something like the 1-kilometer glass shard that is the Kingdom Tower has purpose and simplicity, something that is complete absent in this building and all the little skyturds that surround it. The Khazar Islands will be a $100-billion city composed by 41 artificial islands. They will cover a 2,000-hectare surface. According to the plan, one million people will live in this new "city". The developer—some Haji Ibrahim Nehramli, president of the Avesta Group of Companies—is already negotiating with the companies that built the Burj Khalifa. Construction of the tower will start in 2015. It will be finished around 2019, with a total price tag of $2 billion. Now, imagine the process of building this in a virgin ecosystem and then having 1,000,000 people move in. Even if they get their sewer system right and don't have to use trucks to get the poop out, the impact will be enormous. But of course, who cares. Screw it. Let's play SimCity. What's your favorite example of skyscraper turdchitecture? Which are your favorite worst tall buildings in the world. Tell me at jesus@gizmodo.com.